Paper • ISBN-13: 9781560257301 • 8 in x 5.6 in • $15.95 •385 pgs. The setting is Boston, Fall 1969. Radical groups plot revolution, runaway kids prowl the streets, cops are at their wits end, and work is hard to get, even for hookers. Hobie McNutt, a seventeen year old runaway from West Virginia drifts into a commune of young revolutionaries. It’s a warm, dry place, and the girls are very available. But Hobie becomes involved in an increasingly vicious struggle for power in the group, and in the mounting violence of their political actions. His father Hunter, who has been involved in a brave and dangerous campaign to unseat a corrupt union president in the coal miners union, leaves West Virginia to hunt for his runaway son. To make ends meet, he takes day-labor jobs in order to survive while searching for him. Living parallel lives, their destinies ultimately movingly collide in this sprawling classic of radicalism across the generations, in the vein of Pete Hamill, Jimmy Breslin, and Richard Price. 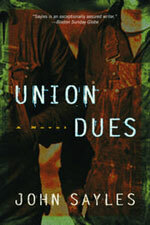 Union Dues was nominated for a National Book Award as well as the National Book Critics Circle Award.